eVo Body Sculpting is non-surgical fat reduction treatment that freezes and destroys fat below the surface of the skin. 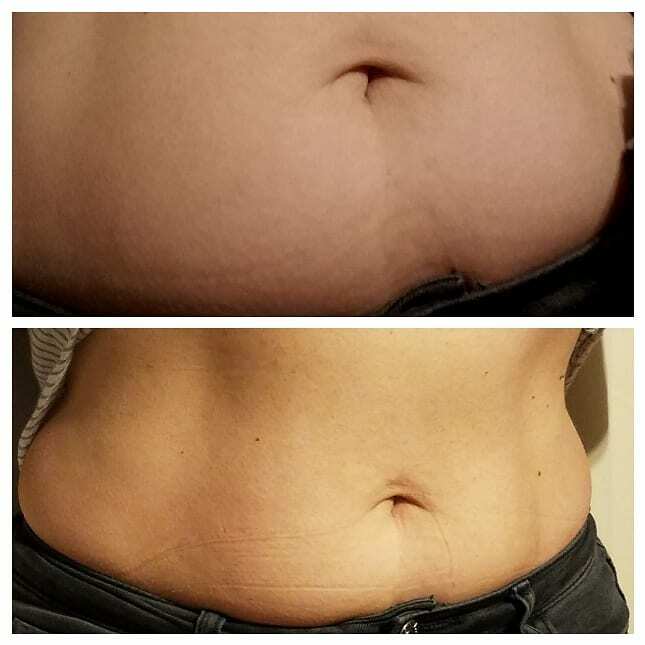 It is a Cool Slimming technology and is great for treating stubborn areas of fat resistant to diet and exercise. Say Goodbye To Belly fat! You exercise. You eat right. But some stubborn fat bulges are immune to diet and exercise. The eVO Slimming/Sculpting technology is a revolutionary non-surgical body contouring treatment that freezes stubborn fat, which then is naturally eliminated from your body. No needles, no pain, no surgery, no downtime. It’s FDA-cleared, effective and does exactly what it’s supposed to do. eVo Sculpting Treatment - Results After 1st and 3rd Session. Just like the well known CoolSculpting, eVO sculpting is using Cryolipolysis technology to destroy unwanted fat cells. The mechanism of action of Cryolipolysis is based on generating apoptosis (death) or necrosis of the targeted adipocytes (fat cells) that are more susceptible to cooling than other skin cells. The precise application of cold temperatures triggers apoptosis (death)of the adipocytes, which invokes an inflammatory response and leads to slow digestion by surrounding macrophages. In clinical studies, cryolipolysis was shown to reduce subcutaneous fat at the treatment site by up to 25% after one treatment. Improvements were seen in 86% of treated subjects. At 73%, the patient satisfaction rate is higher than with other technologies used for noninvasive lipolysis (radio frequency, ultrasound and laser technologies). Cryolipolysis has been proven to be a very safe method for body contouring, and is accomplished with only minimal discomfort. Expected side effects are temporary erythema, bruising, and transient numbness that usually resolve within few hours after treatment. Cryolipolysis is considered to be both safe and efficient with a high patient satisfaction rate. Q: Can I return to normal activities after the procedure? A: eVO cool slim is completely non-surgical, so you can return to normal activities immediately. Some patients experience redness, minor bruising, tingling, numbness or minor discomfort in the treated area, but this is temporary and will resolve completely. A: The fat tissue is suctioned into the two cooling vacuum panels, and you rest comfortably for 45 minutes, reading a book , checking your facebook or listening to music. Q: When do I see the results? A: You will see the results in 2-3 months, when fat in the treated areas are finally eliminated from your body. 1-7 cm in fat thickness reduction is reported, with highest client satisfaction rate in comparison to other non surgical fat reduction techniques, such as radio-frequency, ultrasound and laser techniques. Q: How Much does the eVo slim session cost? You may need one or more sessions. ​ We're excited to share a new way for CareCredit cardholders to take advantage of promotional financing, pay at our doctor's office and online.